Willow grouse (L. lagopus) and rock ptarmigan (L. muta) are sibling species with similar phenotypic and life histories that coexist sympatrically in wide areas of their distribution range. These grouse are amongst the most popular game birds in Scandinavia but contrary to other quarry species, no restocking with captive-bred animals has ever been performed. The discovery of two individuals with intermediate plumage features evoked the question of possible hybridization events between both species, an idea that did not seem too unlikely on the basis of habitat overlap. Thus, to assess whether any genetic exchange is occurring, we used different Bayesian-based admixture analyses of multilocus genotypes determined at twelve microsatellite loci. We also obtained mitochondrial COI-sequences from a selected number of individuals to infer the maternal geneflow and potential introgression. The capacity of our panel of microsatellite markers to detect hybridization was verified using assignments of simulated genotypes. We then evaluated the extent of hybridization in an actual sample of 111 individuals collected in a 100-km2 area in the Scandinavian mountain range. An admixed condition was verified in one of the suspected hybrids, that seemed to carry a L. muta genotype with partial L. lagopus introgression. In addition, more than 4% of L. lagopus showed signs of hybridization under the most conservative scenario with respect to discrepancies between population assignment methods. This was unexpected, given that no L. lagopus displayed any apparent intermediate plumage features. 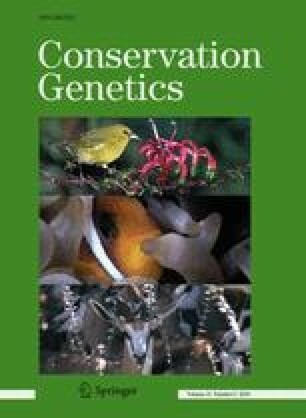 Furthermore, interspecific geneflow of mtDNA haplotypes was lower than expected; which suggests that Haldane’s rule might apply for these two grouse species. Hence, plumage identification of hybrid ancestry is not always reliable and might lead to biases in the estimation of hybridization rates. Hybridisation may be expected to increase if the climate gets warmer as the habitat overlap between the species will become more extensive. We discuss whether hybridisation is a threat to the long-term survival of any of the two species. We are very grateful to Johan Dannewitz, Johan Stendahl and Anders Westlund for sample collection, to Gunilla Engström for help with mtDNA sequencing, and to François Besnier for assistance with the graphical outputs. We also thank two anonymous referees for valuable comments on previous versions of our manuscript. MQ thanks the financial support provided by the Stiftelsen Nils von Hofsten, Lars Hiertas Minne and Hierta-Retzius, and acknowledges a postdoctoral fellowship from the Fundación Alfonso Martín Escudero (Spain) and two ConGen grants to attend to the ESF-funded conferences held in Tällberg-Sweden (2008) and Trondheim-Norway (2009). CGT thanks the Swedish Hunters Association and the Faculty of Forestry at Swedish University of Agricultural Sciences for financial support. JH was supported by the VR (the Swedish Research Council) and was one of the organizers of the ESF-funded workshop named “Ecological Genomics” held in Tällberg (2008).